What’s Clogging My HVAC Filters? 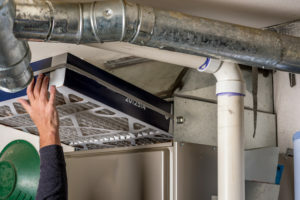 Keep your HVAC filters clean to increase efficiency. Without clean filters, your home’s HVAC system can’t run smoothly. The problem is, the more the system runs, the sooner its filters are filled with dust and other allergens. Here are some of the things that are causing your HVAC filters to clog. When you live with pets, their hair tends to get on everything in your home. Even if you keep them well-groomed some hair is still going to end up coming off, especially during the spring and summer. During the fall and winter, though, they’ll have thicker coats than usual. This means they’re more likely to produce more hair, even if your pet “doesn’t shed” you’ll probably find those little dog and cat hairs strewn about your home. The more pets you have, the worse it is for your HVAC filters. Look closely at the settings on your thermostat. You should see one that says “on” and one that says “auto”. When you leave it on auto, it will only turn on as needed. If you leave set to “on” that means it is constantly running. While this might not seem like such a bad thing, it means that air is continually passing through your filters, wearing them down and making them less efficient with each passing day. A higher MERV rating is usually a good thing. It means that your filters are higher quality and not just something that’s easily disposable. While you are provided with cleaner air, it also means that the fan on your home’s HVAC unit will wear itself out much faster.